I was delighted to find this perfect example of amazon green and agate blue for a lovely spring / summer 2011 wedding! All photos other than the hydrangea invitations were all taken by Kristin Vining Photography. Aren’t they amazing? I am LOVING the mocha taupe suit! 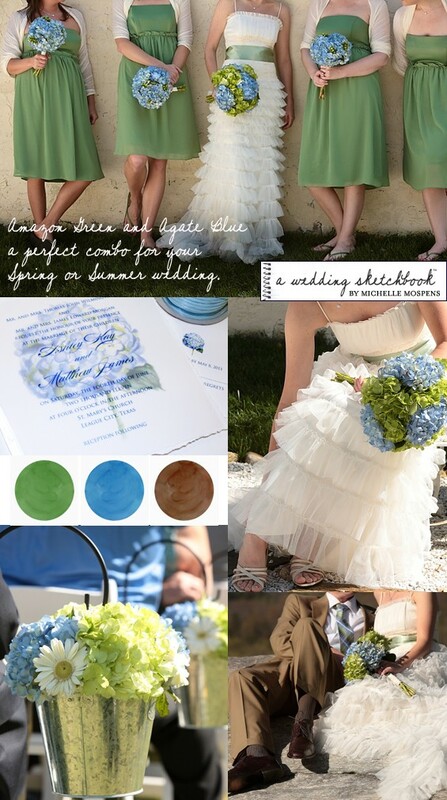 Remember all of your wedding colors do not have to match my examples shown exactly. Colors will vary during your search for dresses and flowers. I do not know the maker of the dresses or suit in these photos. Have fun and best wishes for a colorful and creative wedding day! How about green and orange is it ok? Absolutely! Nonye, Green and Orange are lovely! hi! I’ll be getting married next year april, can you help me find color combinations of green. Thanks a lot! Hi Lorwina, Apple green is a lovely choice.